"Weinland Homes and their subcontractors are the kind of custom home builders Colorado can be proud of. Whenever our Association needs building/construction advise we do not hesitate to contact Mike for that information. Mike not only has an excellent reputation with the Loveland-Berthoud Association of Realtors, he has the same reputation within the community. It's always a pleasure working with Mike, his staff and his workers, and the Realtors' Association recommends Mike highly." For the last fifty years, Weinland Homes has stood as the best custom home builder and general contractors Loveland CO has to offer. Weinland Homes firmly holds true to the company's original focus - help families and businesses in Northern Colorado realize their dreams through unbeatable custom building. Whatever the project, we listen closely to your vision and offer inspired guidance along the way. The close relationships with our customers and our subcontractors are what make us the best custom home builders Colorado has to offer. Strong working relationships with all subcontractors allow Weinland Homes to provide tremendous visibility before and throughout the construction process, assuring your custom home will always stay within budget. If at any time the plans or budget must be adjusted, the customer is always contacted for approval before the job goes any further. You have many options when it comes to choosing a custom home builder. But ask around the Loveland community and there's one name you'll hear again and again from raving customers - Weinland Homes. © Copyright 2006 - 2019 Weinland Homes Inc. All Rights Reserved. Green Home Builders Colorado, Weinland Homes General Contractors Loveland CO provide luxury custom homes and commercial construction at affordable prices. 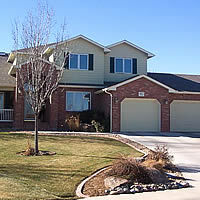 Proudly serving Loveland, Fort Collins, and the entire Northern Colorado area for over thirty years.